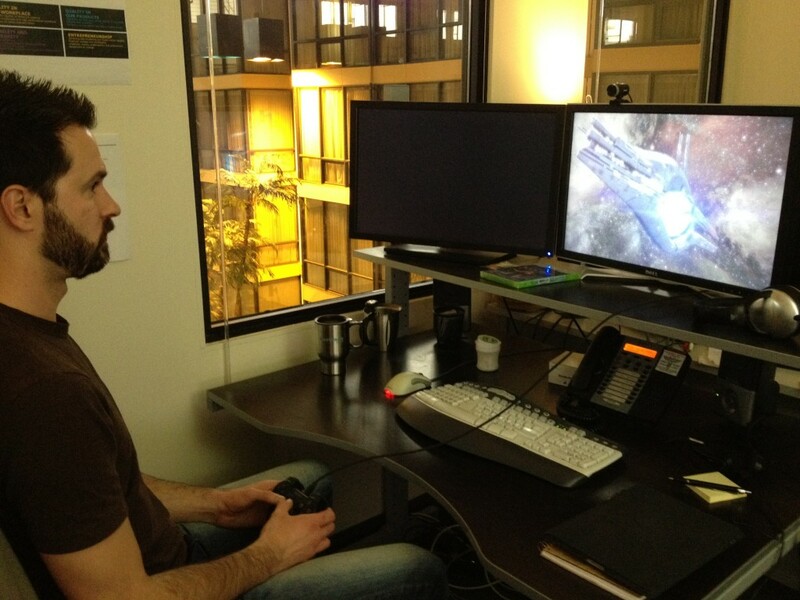 I’m Ryan Warden, the External Producer for Mass Effect Trilogy. I’ve been with BioWare for almost 9 years now – first as a tools programmer, then working with external teams to coordinate the translation and foreign-language voice recording for the Mass Effect series. Lately I’ve been working to help bring you Mass Effect Trilogy for Xbox 360, PC, and PlayStation 3. We began work on Mass Effect Trilogy in earnest last April, shortly after Mass Effect 3 had shipped. The trilogy was complete, but there was a slight complication — there are people who had missed out on one (or more) titles in the series. From day one, we had announced that Mass Effect would be part of a trilogy. Jumping into the series at a midpoint could be intimidating. One thing you should know about our development team is that we’re all very passionate about the trilogy, the entire Mass Effect universe. So we started looking at ways to take away any intimidation or barriers players new to the franchise might feel, while also providing an amazing overall experience at a great price for the holidays. So the Mass Effect Trilogy was born. Now I know that may sound like an easy thing to do, but it actually took a lot of talented people and a lot of effort to make this happen – for every version of Mass Effect Trilogy. Even for the platforms we’ve launched all three games on before, reissuing a game isn’t easy. There isn’t a switch in the game code that you can flip and suddenly it runs on newer, completely different hardware architecture or a new online client. There is no such thing as “just a port.” Luckily, we have great partners at Microsoft and EA who were instrumental in helping us make as seamless of an experience as possible for all three games. Then there was building the original Mass Effect for the PlayStation 3. Fortunately, we had a huge head start because of the work we had done with Mass Effect 2 and Mass Effect 3 for PS3. With that said, the original Mass Effect game was built completely differently than its successors, as we’ve learned a lot of lessons since then about how-to and how-not-to build a game. To be completely honest, I thought that it was unlikely that we could port Mass Effect in less than a year. It might take three years. Maybe even twenty-three! Fortunately, the team at Edge of Reality, an external team we’ve worked with in the past on many projects, thought otherwise. So we decided to try. There were some complications. The audio technology that we originally used was no longer supported by its developer… and the engine didn’t support the PS3. “No problem,” said Edge of Reality, and they found a solution. The levels and art assets in Mass Effect were massive and streaming into memory would probably have to work differently on the PS3 – which is NOT a trivial issue. “Shouldn’t be a problem’” said Edge of Reality, and they found a solution. We found a solution, but the solution took a lot of time and effort. It wasn’t easy, but early this summer, we had the game running and feature complete – something that made eyes bug out of heads around the office. We were near the end of the project, and had tucked in for the big push. There were definitely more than a few late nights. During (Canadian) Thanksgiving weekend, I ended up working 65 hours! But these types of deadlines and pushes are always made easier when you are working with awesome people. We all banded together. Our internal team cranked into high gear and Edge of Reality really turned on Beast Mode and started crushing bugs. We worked around the clock to ensure the game performed at, or better-than, the performance metrics that we had from the Xbox 360. And they did it. Mass Effect on the PS3 runs pretty damn well. We have since passed the game on to manufacturing. I’m happy to announce that on December 4, 2012PlayStation 3 owners will be able to play the original Mass Effect for the first time, either by getting the Mass Effect Trilogy in stores or downloading Mass Effect as a standalone title through the PlayStation Network. It’s a really special moment for me and everyone involved and we can’t wait for you to play the game. I hope you enjoy it, and I hope that you get the same chill down your spine that I still do when the credits begin to roll. Before I go, I wanted to address another question we have been seeing a lot of — about DLC and how that’s weaved into each edition of the Mass Effect Trilogy. The PlayStation 3 version of Mass Effect Trilogy will have the original Mass Effect with Bring Down the Skyintegrated into the game, both on-disc and on the PSN download. Mass Effect 2 will still have the same DLC on-disc that it was originally shipped with: Cerberus Network; Kasumi; Overlord; and Lair of the Shadow Broker. Finally,Mass Effect 3 will also be exactly as it originally shipped. The Xbox 360 version will include all DLC that came with the original games – Cerberus Network with Mass Effect 2and Mass Effect 3 remains unchanged as well. The PC is the same as Xbox 360, except both Bring Down the Skyand Pinnacle Station are available for free – just as they are for all PC players who purchases each standalone product today. Mass Effect Trilogy was a great opportunity to provide value for people who had always wanted to get into the Mass Effect series, but didn’t know where to begin. The late nights in the office, the countless emails and cups of coffee were all worth it because now you or one of your friends can experience all three Mass Effect titles for the price of a single game – on Xbox 360 and PC on November 6th (November 9th in Europe), and on PS3 on December 4th(December 7th in Europe). I’m incredibly proud to have worked on each game in this series, and to be able to bring the whole trilogy to you. I hope you enjoy it!